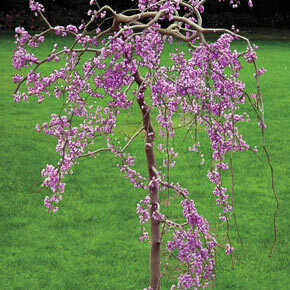 When in full bloom, this unique redbud will stop traffic! The shape of the fruit looks like a pea pod. The pods are 2-3" and are brown. The seed pods develop in October and usually stay on throughout the winter and adding winter interest. Redbuds are tough native American trees, but this one takes the genus to a new level with its unique weeping and twisting branches cascading toward the ground. All four seasons contribute something special to the garden! In spring, each branch is completely covered with lavender flowers; in summer, large heart-shaped leaves spill down the stems in a rich green waterfall. Autumn foliage is bright yellow, and in winter the gracefully weeping branches add interest to the landscape. It grows to 5-6' tall and 6-8' wide, great for a limited space, but you can stake a leader branch and train it to the height you want. 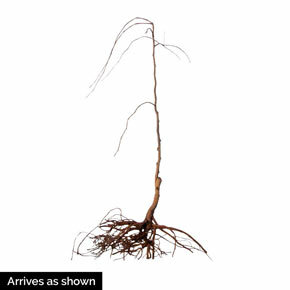 Requires little maintenance, though it needs water the first year while establishing its roots. Zones 5-9. 3' Bareroot. Cercis canadensis 'Covey' PP10328. Full Sun to Partial Shade. Flower Form: The reddish-purple bud opens to a rosy lavender-pink flower in early spring. Pea-like flowers in stalkless clusters. 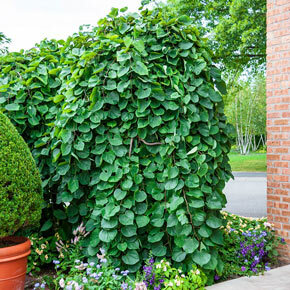 Pruning: Prune to remove wayward or crossing shoots to maintain permanent, healthy framework. Late winter or early spring. Pruning Time: Late winter or early spring. Soil Requirement: Well drained soil, organic matter, but widely adaptable. Additional Information: The Lavender Twist Weeping Redbud, 'Cercis canadensis "Covey", also known as Twisted Lavender Redbud, is a new variety of Redbud that is sure to attract the eye.